The intricacies associated with trust administration can often times leave you feeling overwhelmed.. The broad-stroke information below, about the process works under different circumstances, is a great place to start. Simply understanding the process a bit can help. Feel free to pick up the phone and call my office. This may be the perfect time to use of your Free 30 Minute Legal Consultation to get your specific questions answered. In the meantime, this page provides terms and definitions associated with trust administration, in addition to some first things that need addressed. Settlor – One (or couple) who creates the trust. Trustee – One who manages the trust assets. Beneficiary – One who receives the benefits (for example, income and principal distributions). Revoking or Amending the Trust – This trust is a revocable living trust. The trust may be revoked or amended while both Settlors are living. The Survivor’s Trust continues to be revocable after the first death. Any changes should be done by an attorney and must be in writing delivered to the trustee. Gifts of Trust Assets – Each taxpayer may give up to $14,000 per year per donee (individual receiving the gift). For any gift exceeding the $14,000 exclusion, the donor (person giving the gift) must file a gift tax return. Tax Returns and Taxes – So long as either Settlor is the trustee, he/she will continue to file the same tax returns as he/she has filed in the past. The trust income does not appear as a separate item on Settlor’s tax return. For income tax return purposes, ignore the trust. What Happens in the Event of the Death of the First Settlor? 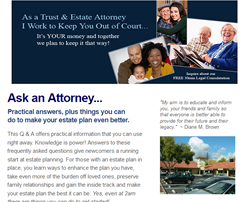 Step ONE – The Agent named on the Durable Power of Attorney for Health Care may make arrangements for burial following the instructions set forth on the Settlor’s Letter of Instruction. The successor trustee should read the Letter of Instructions to ascertain where all the papers are. 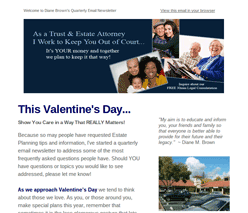 Read more about the duties of an Estate Trustee. Arrange for valuation of all assets in the estate, including joint tenancy. If any assets were not titled in the name of the trust, we may have to file a petition with the court to confirm those assets to the trust. If the trust provisions require distribution of the assets, then all assets must be changed into the name of the beneficiaries. Arrange for filing a final income tax return for the decedent’s income from the beginning of the tax year to the date of death. Determine if an Estate Tax Return must be filed. 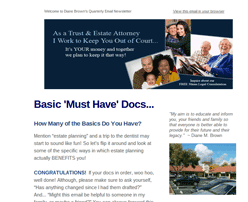 Determine if the estate must file an income tax. Be sure the property taxes are paid by the trustee while the trust is being administered. For a brief overview about some of the duties of the Trustee, please click here. 2. It will help us determine if an Estate Tax Return needs to be filed. It creates a list of all of the assets for Trustee’s use in preparing and accounting of the trust administration. What About Attorney Fees and Trustee Compensation? Attorney’s Fees and Costs – Attorney’s fees for administration of a living trust are currently billed on an hourly basis. The usual cost does not exceed one-third of the probate fee. Attorney’s fees include not only all meetings and phone calls, but also the work involved in filing all forms, petitions, collecting the assets, assisting in the filing of the tax returns and completing the distribution to the proper beneficiaries. They do not include court costs or cost of appraisal. There should be no court costs if all assets are in the name of the trust or payable to the trust at the death of the Settlor. Trustee Compensation – The Trustee is entitled to reasonable compensation for his/her services. Any amounts that the trustee receives as payment for services are taxable income. PLEASE NOTE: This is an overview only, and is not meant to be a comprehensive guide. If you have questions, it is best to contact Diane as each case is different.